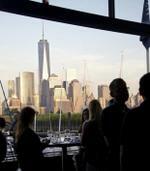 At Battello, on the Jersey City waterfront, the view vies with the victuals for the heartfelt oohs and aahs. The February issue of New Jersey Monthly names Battello in Jersey City one of the 20 Best New Restaurants in New Jersey. On the Hudson River, its tall windows facing the towers of Lower Manhattan, with a liquor license, 175 seats and rooms for private parties, Battello is the big stage chef Ryan DePersio has long craved. He still considers Fascino, his family’s 11-year-old Montclair BYO, “my baby.” But at Battello, DePersio’s eclectic “Italian without borders” cooking earns the spotlight, especially the bold seafood dishes, like pignoli-crusted halibut braised in a pancetta broth with vegetables or skate wing in a rice crust with fava bean risotto. 502 Washington Boulevard; 201-798-1798. See where your favorite restaurant ranks at NJMonthly.com!